As kids in the 1980s, Sam Brenner (Adam Sandler), Will Cooper (Kevin James), Ludlow Lamonsoff (Josh Gad), and Eddie “The Fire Blaster” Plant (Peter Dinklage) saved the world thousands of times – at 25 cents a game in the video arcades. Now, they’re going to have to do it for real. In Pixels, when intergalactic aliens discover video feeds of classic arcade games and misinterpret them as a declaration of war, they attack the Earth, using the video games as the models for their assaults -- and now-U.S. President Cooper must call on his old-school arcade friends to save the world from being destroyed by PAC-MAN, Donkey Kong, Galaga, Centipede, and Space Invaders. Joining them is Lt. Col. Violet Van Patten (Michelle Monaghan), a specialist supplying the arcaders with unique weapons to fight the aliens. First, Kevin James is the president??? That might be more unbelievable then real-life arcade games. But seriously, the more I see of this movie, the more I get excited. I know trailers can deceiving but it appears the video games are the stars of this movie which I hope to be true. Catering to the children of the '80s should be the main objective with Sandler's humor sprinkled in. So far, 'Pixels' is on the right track and I can't wait to see it in July! 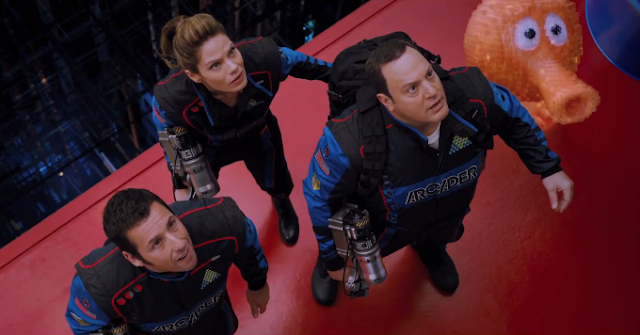 Did the 2nd trailer help or hurt your expectations for 'Pixels'?